Try out MIB, the exclusive Holmes Place signature class that focuses on toning and strengthening your buttocks, belly and legs in a high intensity 30 minute complete workout, an important addition to your weekly schedule. However, nice looks is not the only reason to get into the intense and fun rhythm of MIB! In this program you will discover a mix of aerobics, dance and grounding exercises that balance fun and weights with intense repetitions in combination with cardio. Push ahead with TRX®! This is a highly effective training method, carried out using special straps, under the guidance of our certified TRX Trainers. An innovative type of exercise that uses your own bodyweight to help you improve strength, balance, flexibility and joint stability, as well as body coordination, while increasing your bone mass without lesions and injuries. We know that fitting fitness into your busy schedule is a challenge. That's why we have created Xpress classes. These innovative fitness programs offer all the benefits of small group training with the guidance of a qualified Trainer and all the fun of a group class in a condensed format, designed to fit into your busy routine. Experience our unique Functional Xpress in a dynamic weight training workout at various intensity levels, using sandbells. Try out our best group class for muscle stimulation and a fit shape, suitable for everyone, using weights and bands that help workout your whole body more efficiently. Do you want to burn calories, strengthen your core and sculpt your body? This Les Mills program is exactly what you need! Try this full-body barbell workout which pushes the major muscle groups to the limit and even working out those muscles you didn't know existed until now! 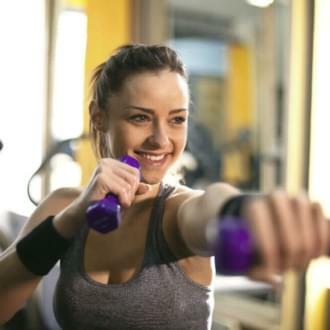 Throughout the class you will use light weights in a repetitive manner to achieve a toned body without any unwanted bulky muscles, burning up to 590 calories in just 1 hour. Water workouts offer unparalleled benefits and it's worth giving yourself the opportunity to discover them. A 30-minute pool workout is enough to burn 300 calories! Aqua Fit offers muscle toning, using water resistance for exercise and wellness. Feel the power of the water sculpting your body! If Fitter Than Yesterday is your choice, we are here to inspire you and give you the motivation you need to start a brand new fitness journey* towards your personal renewal, in the best possible way. Do something good for yourself today and feel better than yesterday!